Poor customer service or am I at fault? So I have emailed this new company about a new razor. I will not name their company, but I will refer to this person as "G" from Spain. I originally emailed them on Tuesday asking about the razor and how I wanted to try it because it sounded like it was right up my alley. We exchanged information and I expressed my interest and sent them my PayPal info. They told me they would invoice me tomorrow (Wednesday and ship it out Thursday. I was still interested...Until another member mentioned that it is not ideal for coarse hair. On Wednesday, I thanked the member for the info and said that I almost pulled the trigger on it. The night I was supposed to receive the invoice, I changed my mind. I also did not receive the invoice of the razor on Wednesday. So Thursday rolls around and all of a sudden, I receive two emails, the first with the shipment info and the second with the invoice. I was shocked! So I emailed "G" immediately to inform him to cancel the shipping if it is possible and I told him that I was no longer interested. A few nasty emails have been exchanged...I have kept my cool and have been professional about the situation. And since then, he has called me "stealing" and the latest name calling was ***hole. I have all this on my email traffic. I will not post emails yet. I am asking for others' opinions about this. I understand that I was almost certain about buying the product, but I believe that they shouldn't have sent it without payment. I shouldn't be blamed for their mistake. I offered to not use it and will return it to them after they pay for shipment (thats when they called me an ***hole). I offered resolution but "G" from Spain acted unprofessional and was very childish. I'm very surprised, but I agree they should have not ship a product without sending you an invoice first and without finalizing payment. So you haven't paid for it yet? Did you sent him a message on Wednesday changing your mind? They bad thing also is the time difference. Having said that anybody that talks to me that way can go and pound sand. That's uncalled for no matter what. I did not pay because I did not get an invoice on Wednesday. And that same night, a fellow member from here had mentioned the razor was not good for coarse beards. So I replied stating that. I almost pulled the trigger (this was Wednesday night and was on a forum in TSN). I did not send him an email because when we spoke on Tuesday, he told me that he was going to send me an invoice the next day (Wednesday). I am stationed overseas and is only an hour ahead of me. I have saved all emails as back up just in case he tries to go public or somehow get some authority involved. I agree with Hector that invoicing should have occurred before the shipment and at that point you could have declined - end of story. His attitude was not acceptable. I'm not sure what anything you posted on TSN had to do with it. You told them you'd be buying (sending PayPal info no less), and it sounds as if you never let them know you changed your mind before the invoice was sent. As for the name calling and anger... Totally out of line, but I understand why he felt robbed. If it was me, I would have bought the razor for my lack of communication, and eaten the small loss by selling it on the bay or BST. You might feel embarrassed and take a small loss, but that's a lot better than this sort of conflict and drama with a sore conscience. If a payment was not made, the razor should not have shipped. In my humble opinion, there are very, very limited circumstances that would make this statement not applicable. Even if an invoice was sent, if payment was not made, the razor should not have shipped. I realize that "G" may have been trying to provide an exceptional level of customer service, and was probably going out of his way to ensure that you were a happy customer, but unfortunately for "G", an inquiry is not a purchase. The deal is not made and the product is not purchased until a payment is made. The only time I can see this being different would be a personal deal made between 2 individuals. IF the arrangements are "I will send this on X day. Give me payment on Y day", then you decide not to pay, you would be at fault. But as a merchant/artisan/vendor, if I send you the item you have inquired about before you send me payment for the purchase, I don't have any right to be insulting and demanding should you tell me "It was just an inquiry. I don't want it." or "I changed my mind". I consistently told him I will return from the beginning. He failed to provide the invoice on the day he told me to. During that time, I changed my mind. The next day on Thursday, I received and email saying that he shipped it and then another email saying that I will receive an invoice. It's tough though, because there was a lack of communication and both parties seem to be partly at fault. I'd want to somehow make amends for my end of it though, because the way it goes now, he loses from every perspective, and you lose nothing. It's tough though, because there was a lack of communication and both parties seem to be partly at fault. I'd want to somehow make amends for my end of it though. 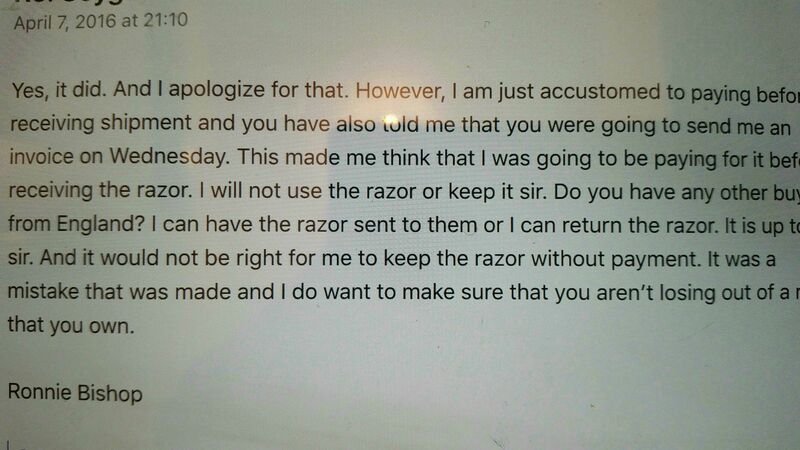 I would feel the same way, and might even go ahead and make the payment for the razor, as you stated earlier, just to ease my own conscience and try to repair the relationship with the vendor.